Note: The title was given erroneously as The Message of Headquarters in the schedule published in the September 13, 1913 issue of The Moving Picture World. In a review in The Morning Telegraph, September 14, 1913, the title was given as Message From Headquarters. "Three reels of thrill. A young Italian, an officer in the Carabineri, saves an American tourist in Italy from bandits, and so incurs everlasting enmity of those evildoers, who have confederates in all parts of the globe. Visiting the United States, he is captured by American confederates of the bandits, and only escapes through a fellow-captive Yankee detective's message to headquarters." "The Message to Headquarters is something new in the way of Thanhouser plays. It is melodrama from beginning to end - and yet, melodrama which seems to have a most convincing atmosphere of realism in spite of a few rather impossible stunts which can better be done in a few seconds before a camera than in actual life. These stunts, however, will not be amiss to the average audience - because they are thrilling enough to make the spectator catch his or her breath and wonder what is going to happen next. The Messrs. Lonergan have utilized their familiarity with the Italy of today - particularly, the brigand-infested slopes of Vesuvius back of Torre del Greco and Herculaneum - to give an effective setting for the beginning of their play and make the rest of it seem plausible. "There are the usual rich American and his children - kidnapped by the brigands; the dashing captain of Carabineri, who rescues them and earns the hatred of the brigand chief; and all the supporting characters that one expects to find with such a combination. Then the scene changes to New York - the underworld, Secret Service territory of New York which we read about in the papers but seldom see, because we feel that we are probably safer in the more civilized wards. 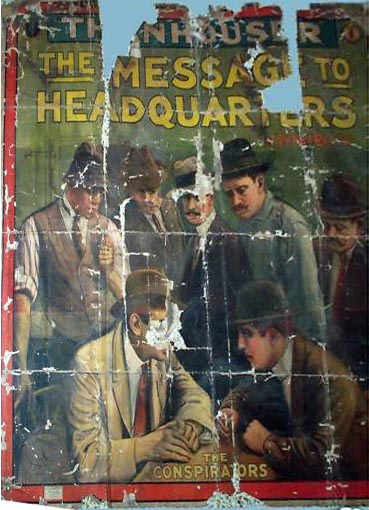 There are abductions, with and without chloroform - very deadly and murderous trials before masked tribunals of the Mafia-bound and insulted prisoners - Mafia spies in the Centre Street Police Headquarters - dashing rescues and gunplay by our handsome Mounted Police - and one scene in which a sub-hero of the play - while hanging by his feet, head-downward, from the ceiling rafters - manages to free his arms from their bonds, swings himself back and forth until he catches a telephone screwed to the wall, and sends the message to headquarters which saves himself and his hero-in-chief from the most unpleasant demise. "The moral of the play is really good. The scoundrelly Mafia get the worst of it in the end, as all villains should. The hero gets the right girl. The assistant hero gets another one. The defeated scoundrels of the Mafia get a very comfortable pay check for their horrid work. So every one is satisfied - particularly the audience. In fact, if any audience could possibly ask for more exciting incidents - more topsy-turvy stunts and hairbreadth escapes than the Messrs. Lonergan have contrived in this play - they are mighty hard to please. We predict a long and successful run for The Message to Headquarters - and beg the authors to carefully nurse their stock of thrillers in order to avoid running out of material on future successes of a similar nature." "A wealthy American, traveling through a lonely part of Italy, was captured by bandits and held for ransom. He was rescued by an officer of the Carabineri. The bandit chief was captured and vowed vengeance, but the young officer dismissed his threats contemptuously. The officer found favor in the American girl's eyes, and when she returned to America she had promised to marry him. A few months later the officer was ordered to America on a secret mission, and wrote his fiancée that he would soon be with her. At the pier he was met by a man who displayed the badge of the United States Secret Service, and showed him a letter from the chief. The young man took a hasty leave of his sweetheart, promising to see her the following day, and entered a waiting carriage with his companion. He thought their destination was the office of the Secret Service, but before he could suspect anything wrong he was overpowered and taken into a lonely house. There he found another captive, the real member of the Secret Service, whose credentials had been taken away and used to ensnare the Italian officer. "While the conspirators were subjecting the Carabineri officer to the ordeal of a mock trial, the detective, tied to one of the ceiling beams, hung head downward. He realized that unless help soon came the young officer would be put to death. At the other end of the room was a wall telephone. Although he could not loosen his bonds he succeeded in reaching the telephone and sending a call for help to headquarters. Assistance arrived when the young officer had only a few minutes to live. The conspirators were captured and punished, and the Italian officer warmly thanked his preserver, who, though a captive, had saved him from death." "Lloyd F. Lonergan and Philip Lonergan are responsible for the excellent quality of the story upon which this production of two reels is based. Italy has been chosen for the scene of the early portion of the play. Then it switches to America, where a startling series of events takes place that thrill unspeakably. The foundation of the story is the kidnapping of a rich American and his children by the brigands which infest the slopes of Vesuvius and their rescue by Captain Carabineri. During the chase in New York the most villainous deeds are perpetrated by the Mafia gang. The detective and Captain Carabineri are outwitted, seized and bound to posts in the cellar of the building occupied by Mafia and his people. The detective in an attempt to escape is caught and actually hung head downward from the ceiling. 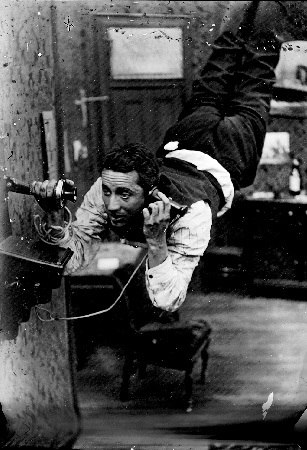 A tense moment occurs at the climax of the story, when he swings himself from his suspended position to the telephone, which is fastened to the wall, and manages through great difficulty to telephone the message of their peril to police headquarters. A more thrilling photo-play has never been placed on the screen. The stirring events come thick and fast, and the film makes good entertainment." 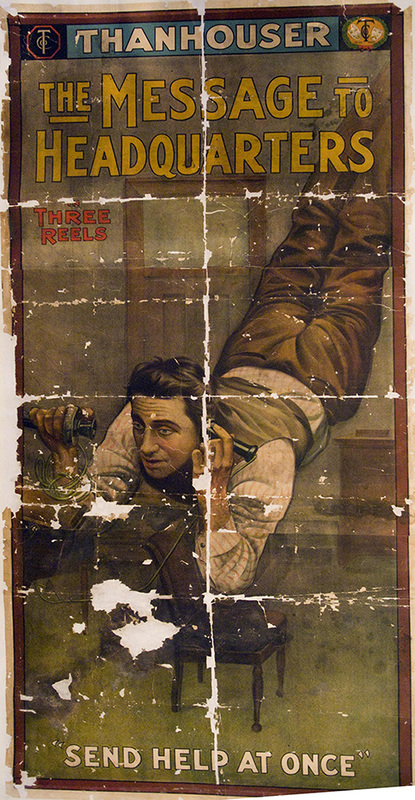 "The last two reels of this three-reel number bring the interest up very strongly. The first reel was weak in point of atmosphere and plot development; the fighting with the brigands seemed aimless and without definite meaning. The later adventures of James Cruze as the count, and his detective friend, in America, leave little to be desired in the way of excitement. The tortures inflicted by the Mafia were both painful and sensational, but the scene where the detective, hanging by his heels, swings to the telephone and summons help was very well devised. In the way of frank sensationalism the last two reels are very successful, but overacting is indulged in almost to the point of burlesque."